Week 2 of TCMF Well Underway! Waking Fable “kills it” Tuesday night at Texas Community Music Festival IX. Austin — The ninth annual Texas Community Music Festival returned to Central Market Tuesday night with some memorable performances by newcomers and TCMF veterans alike. The program was kicked off by TCMF rookies, Waking Fable, an Austin-based quartet who performed a primarily original program, mixed in with a couple of creative and exciting twists on some old favorites. It may have been one of the more inspiring sets of the festival to date! They were followed by the Austin Banjo Club, who have performed in virtually every TCMF since the beginning. They didn’t disappoint, strumming and plucking their way through a set of classic jazz favorites, some of which dated back to the turn of the century … the 20th Century! The evening culmintated with a return performance from About 7, who presented an hour of Americana, replete with the sweet combination of sounds produced when you add a violin, mandolin and dulcimer to the traditional mix. Another evening of diverse music in the biggest musical smorgassbord anywhere, TCMF! Wednesday’s program begins at 5:30pm, with the Pecan Street Brass, a classical brass quintet, including members of TCMF’s sponsoring organization, the Austin Civic Wind Ensemble. At 6:45, the Inside Out Steel Band will fill the air with sounds from the tropics, and at 8:00, TCMF will feature the Austin Mandolin Choir. 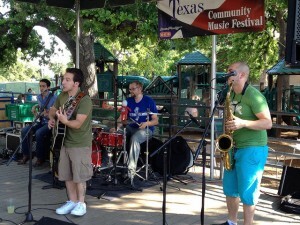 Texas Community Music Festival will continue Thursday and Friday evenings and go on all weekend, ending at 9pm Sunday, April 27. So bring the family. Every performance is free. And every performer’s playing for the love of music and our community. What could be better than that?